International singer songwriter Zee Gachette (alias Z-STAR, pronounced ‘zee-star’) is hailed as ‘A legend in her lifetime’ and described as ‘The lovechild of Jimi Hendrix & Nina Simone’ and ‘the female version of Prince’. Her label, Muthastar Records, required a press pack to promote Z-STAR’s forthcoming release as unique as the artist herself and reflective of her music and her roots as an underground artist. It also had to be an eye-catching, engaging and standout piece on the busy desks of press contacts who would receive it. Rather than design a traditional booklet / brochure format, we created the innovative solution of a limited edition poster press-pack. 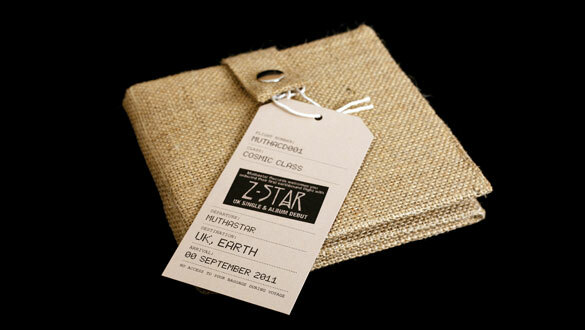 This was designed In a raw and unfinished style then inserted and delivered in a unique handmade hessian wallet also designed and produced by us. A clever inner pocket accommodated the demo CD.